Shannon and Dean Hale are the husband-and-wife writing team behind the graphic novels Rapunzel’s Revenge and Calamity Jack, both illustrated by Nathan Hale. Shannon Hale is also the author of the Newbery Honor-winning Princess Academy as well as The Goose Girl, Enna Burning, and other novels. They live in Salt Lake City, Utah. LeUyen Pham is the illustrator of many books for children, including God’s Dream by Archbishop Desmond Tutu and Douglas Carlton Abrams and Aunt Mary’s Rose by Douglas Wood, as well as the Freckleface Strawberry books by Julianne Moore. LeUyen Pham lives in California. This charmingly told book has lovely old-fashioned illustrations and a great message: You can’t judge a princess by the color of her gown. The rounded, cartoony illustrations featuring chubby characters keep the fight sequence soft and comical. ... The gently ironic text will amuse readers (including adults reading the book aloud). The large print and illustrations expand the book to a longish-yet-manageable length, giving newly independent readers a sense of accomplishment. ... Action, clever humor, delightful illustrations and expectation-defying secret identities—when does the next one come out? 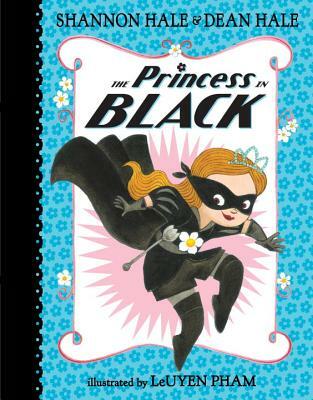 The authors of "Rapunzel’s Revenge" and "Calamity Jack," writing here for a slightly younger audience, successfully turn the treacly princess genre on its ear, offering beginning readers a clever, adventurous, and self-reliant heroine who is equally at home in black or pink. Pham’s watercolor-and-ink illustrations, rendered in the style of the Disney classics, effectively contrast Magnolia’s identities and emphasize the text’s humor. Clever details (Duff and his goats eat popcorn on the sidelines as they watch the PIB do her thing) and short manageable sentences make for a promising, and sure to be wildly popular, new series debut. The Hales translate the humor and adventure that characterize their Rapunzel’s Revenge into prose form for a younger audience with aplomb and wit, giving amusing nods to both the Disney princess tradition and the superhero genre. Short sentences, a simple vocabulary with the occasional challenge, a manageable length, and a near picture-book level of illustrative density give this chapter book immense accessibility. Pham’s watercolor and ink art has a goofy cartoonishness, with the Princess’s doe-eyed damsel figure contrasting entertainingly with her ninja-like moves, and the monsters themselves are a parade of wacky Muppet-like creatures. Whether they prefer pink sparkles or superhero capes, readers, especially newly independent ones, will find themselves anxiously awaiting the next installment of the PIB’s adventure. The colorful illustrations on each page help move readers through the story as the heroic princess saves the day. The action-packed text in this beginner chapter book will enthrall and is ideal for independent reading or reading aloud. The ending leaves readers with just enough of a wink to hint at a future installment. Give this engaging read to fans of “Bink and Gollie". The Hales drop narrative breadcrumbs throughout the story, setting up subsequent titles in the planned series, and they build comic tension by alternating scenes of the masked princess’s monster-fighting with ones starring Duchess Wigtower, who Princess Magnolia has left waiting back at her castle, and who has a fondness for uncovering secrets.... Pham offers little jolts of energy and wit on every page, with full-page and spot illustrations that have the vivaciousness and irreverence of contemporary animation. Finally, a book for kids where a princess saves herself. ... Kids will love meeting this new non-traditional princess who bucks the stereotype of princesses past. This charming begining chapter book will please princess and action fans alike. For readers who love "all things princess," it provides a fabulous vision of how the definition of a role can expand.